Fill your senses with adventure and excitement as you take control of a 4-wheel drive Jeep Wrangler and wind your way through the rugged back roads of Revillagigedo Island. Then grab a paddle and join your companions in a 37 foot, 20-passenger Indian-style canoe to navigate your way across a mountain lake, where a hearty snack and nature hike await. 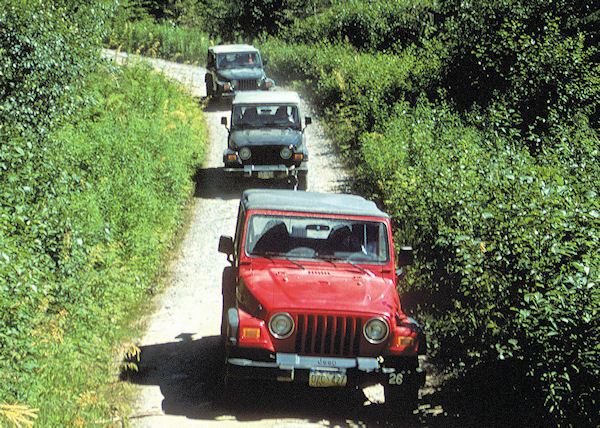 For the Jeep portion of the tour, you'll be paired with traveling companions in groups of four, and begin the adventure into the mountainous roads of the Tongass National Forest. The route takes you through lush rain forest, and up mountain roads to view magnificent scenery. By means of two-way radio your group leader and guide will provide you with interesting and informative commentary along the way. You'll be fascinated by the area's natural history as you pass through old growth and new growth forests. Learn about the timber industry's reforestation methods while you stop for some fantastic views and photo opportunities. Along the route there will be an opportunity to change drivers, if more than one of you want to get behind the wheel! The Jeep portion of your tour concludes with your arrival at Lake Harriet Hunt. Here, you'll experience a unique ecosystem from the vantage point of a large, easy to paddle, guided canoe. On the other side of the lake your expert safari guide will lead a nature hike through an old-growth forest. A remote camp is base for an Alaskan snack, where you'll enjoy a short narrated transfer back to safari base camp and your ship. Please note: Drivers must be 25 years of age with a valid driver's license. Souvenir hats and T-shirts are available for purchase. Dress comfortably in warm clothing. Tour will operate in all weather conditions. Drivers must be at least 25 years old, are required to show a current driver's license, and must sign a liability/insurance waiver. Moderate to good physical condition is necessary for participation in this excursion. Children must weigh at least 40 pounds in order to fit into required life jackets while canoeing. Children 12 and under must be accompanied by an adult. Children 13-17 must have a signed parental consent form to participate in the absence of a parent or guardian. Children under the age of five will not be accommodated on this tour. We will provide a booster seat for children between ages 5 through 8 upon request and subject to availability. This tour operates under a Special Use Permit issued by the US Forest Service. Some final notes: bring your vouchers and dress comfortably for the weather (if your tour is on the water it will be about 10 degrees cooler.) Camera and binoculars are suggested for land-based tours. However, while on tours involving rafts, canoes and kayaks, we suggest you bring disposable cameras.